It would be interesting to interview everyone who was involved in deciding to make this THE fight at this late date. This amount of energy invested a few months ago would have made a huge difference. I attended a gathering at Mother of God Church here in Denver right after the last elections. Everyone was encouraged to write letters to those who had just been elected. Whether by design or by accident, the timing of these education activities seem to me to be a real problem. Looking back at the Civil Unions fight, it would have been much better if Colorado Catholic Conference would have just not done anything. SB14-175. Hope I’m wrong. We’ll know soon. Glad to be wrong this time. Maybe there was a genius at work in this I haven’t appreciated before. Thank you Archbishop Aquila for your leadership, and to our brother Jesus for his walking with each of us as we did the little we could, trusting (most of trusting most of the time) that with God’s help it would be enough. Denver--Sensing defeat, those sponsoring the legislation that had been personally opposed by Archbishop Samuel Aquila was withdrawn tonight. Consideration in the Colorado Senate as a committee of the whole was to have take place yesterday. Clearly a lot of work was put into the rally yesterday, the largest some have said they've seen of that gatherings on the west steps of Catholics that are held from time to time, previously in the last couple of years rallies to oppose so called civil unions legislation that went on to pass. The question now is how to extend a loving olive branch to those who are stinging tonight from the defeat and use this as an opportunity for evangelism. Maybe the sunglasses were a good idea. "The political party assemblies that choose major party candidates for the Colorado legislature have already met and designated candidates for the ballot. The delegates to these assemblies were chosen at neighborhood precinct caucuses across Colorado on March 4." Good point. This is really the start of the 2016 Colorado Caucus. Yes, people can get involved and make a difference. But to leverage their power they should keep in mind the powerful process that puts candidates on the ballot for both major political parties. Archbishop said yesterday he was surprised how many he spoke with didn't even know who their state representative are now. Here's an idea. How about one mass each year to honor our local representative in Federal, state, and local government? The rally at the Capitol yesterday against SB14-175 has already gotten more people involved in the Colorado political process. If it passes, expect more recalls in Colorado, as voters whose representatives ignored the flood of phone calls and emails are targeted and those most vulnerable immediately see petitions being circulated to bring them home and replaced with representatives who truely represent the district. This is more emotional than gun control. 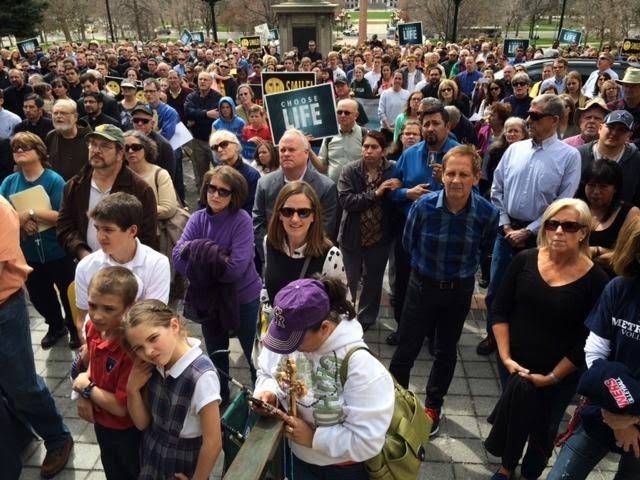 Big turn out at the Capitol this afternoon, Archbishop Aquila's presence this afternoon at the Colorado Capitol sent a loud, clear signal to Catholic legislators who are now serving, and more importantly to those who will be inspired to serve in the future. But I thanked Archbishop for making the effort, it was the right thing to do. In my opinion a primary task of every Catholic Church should be to teach how to take Christ’s love into the existing political system. Catholics need to be the leaven in both major political parties, and they should be better represented at all levels of government. Neighborhood self-directed learning groups could be a powerful way to bring this about; groups formed to inform not reform on any particular issue. Colorado has a wonderful political institution, the Colorado Caucus. Every two years we have the opportunity for a state-wide civics lesson. But new comers to Colorado and those just new to Colorado politics need to be better educated about how to participate. It's been said only 5% of Colorado residents even know the system exists. Both major political parties need new blood in every neighborhood, and they need more every two years for our system to work well. I'm thinking about forming Catholic Neighborhood Clubs across the state. With the Internet, leaders could be quickly identified. Then fill Mile High Stadium each fall in a civic education MOOC (Massive, Open, Online Class) lead by perhaps Archbishop Aquila and Gov Hickenlooper this fall, and Pope Francis and Pres. Obama the following year or in 2016 just before the elections. If you'd like to help in your neighborhood, or if you'd like to help recruit and train neighborhood leaders, please give me a call. (303)861-1447. I'll get back to you as soon as possible. Please do NOT email me until we've had a chance to talk on the phone. Thanks! After Pope Francis has urged Catholics to extend the loving hand of forgiveness, and to not judge others for their sins, his new Archbishop in Denver takes to the West Steps of the Colorado State Capitol this afternoon (Tue, April 15) to lobby, no, to West Step his opposition to pending legislation. This should be an interesting afternoon. It's hard to believe that Archbishop would be acting without some official encouragement from the Church hierarchy. It could be Pope Francis sees the danger of appearing to take the position of just rolling over in legislation that undermines freedom of religion. No confirmation anywhere with local Denver media that Archbishop is still on. It would be great to see Archbishop go into the Capitol and buttonhole Catholic legislators. He certainly has a right to do so in our free (at least for now) society.